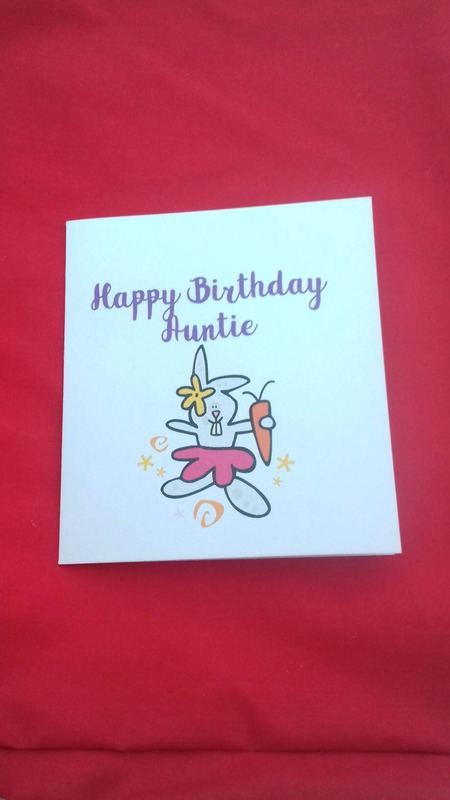 The card is 135x135mm and is white in colour with purple text and reads 'happy birthday auntie" it has a cute bunny under. The inside is blank for your personalisation. The card comes with an envelope and presented in a cellophane sleeve. By purchasing this product your agreeing to Edies Junebugs' terms and conditions that are listed within Etsy. Please see my other items, shipping discounts on multiple buys. Free discount code with your first order. All my items are sent via Royal Mail 2nd class or International standard. The item will be dispatched within 4-6 working days of purchase. Please be aware that I can't gaurentee prints are the exact replica of the picture on the listing. It's impossible due to being handmade. Each typography/ word cloud is priced for up to 10 words and 4 colours. Please do let me know if you require more and we can work from there. For the purchase price there's up to 3 edits to the print, any extra will be chargeable. Changes include- colours, word enlargements, word placement, word arrangement and adding additional words. Due to health and safety there's no refunds or exchanges on earring jewellery. If a product should need returning the return shipping price is to be paid for by the buyer, unless the said item is faulty. Once the item is received in the same condition as sent a refund will be processed within 10 working days. Due to the work that goes into personalised items I am unable to offer an refunds or cancellations, once ordered there's a small window of 4 hours to cancel if you require. After this period the item will have been started to be created so no refund will be available. From customised word clouds please put your words in the "message to seller" box at the checkout. Any customs duty is payable by the customer not myself.